Madison, NJ, might seem an unlikely locale for the discovery of a long-lost art treasure. While Madison, located in the northern half of the Garden State, has an array of large homes, some dating back to the Gilded Age, and is the site of Fairleigh Dickinson University, the town is also home to fewer than 16,000 residents. But Madison’s local government meets in the Hartley Dodge Memorial, an elegant building donated by Geraldine Rockefeller Dodge, daughter-in-law of Standard Oil co-founder William Rockefeller and wife of Remington Arms Chairman Marcellus Hartley Dodge. Geraldine Rockefeller Dodge was a great patron of the arts, amassing an impressive collection during her long (1882-1973) life. Among the pieces she acquired was a bust of Napoleon crafted by Auguste Rodin, the famed French artist. The work, titled “Napoleon Wrapped in His Dream,” was commissioned in 1904 and completed around 1910. It was on display for several years at the Metropolitan Museum of Art before being purchased in 1933 by Dodge at an auction. The bust, the only known political or military figure sculpted by Rodin, was installed in the memorial building in 1942. It would then appear that everyone, at least in Madison town government, forgot what they had. 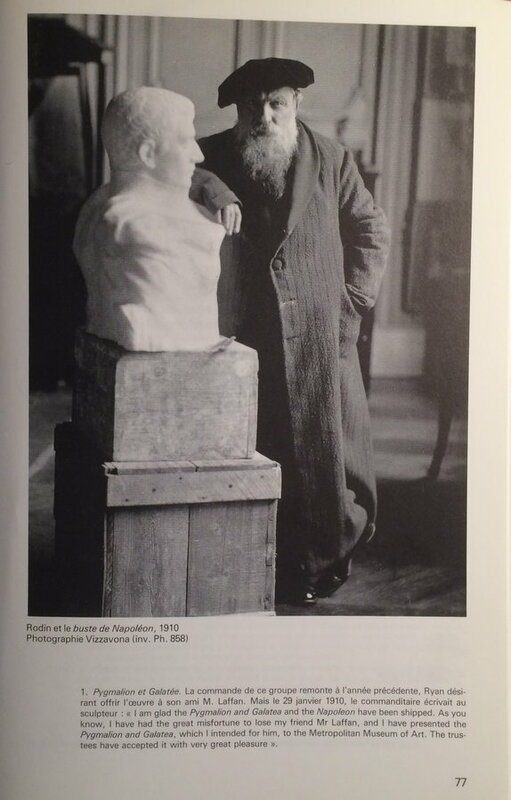 Image showing artist Auguste Rodin with Napoleon bust in early 20th century. 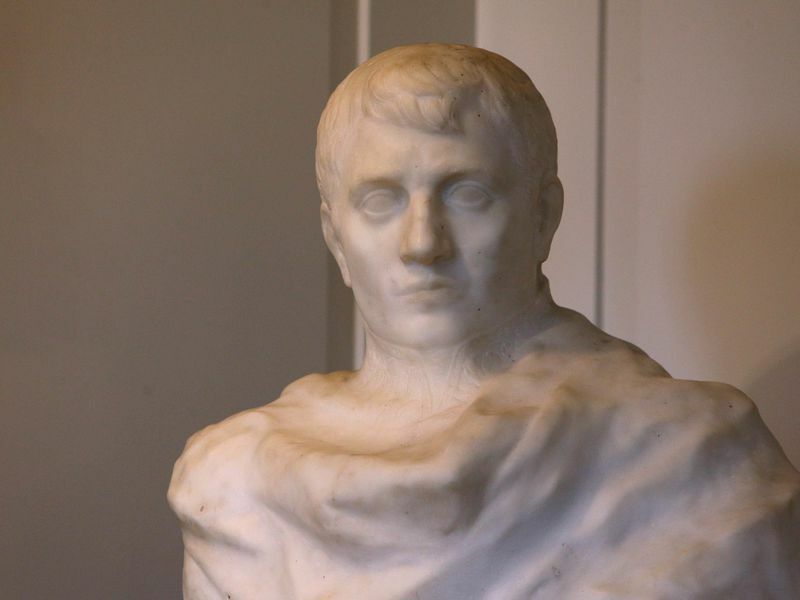 While making a list of what was in the building, young Mallory Mortillaro came across the bust of Napoleon, which had been pushed up against a wall in the council room of the building. Mortillaro “ran her hand at the base of the bust and felt something chiseled,” said Nicolas Platt, the foundation’s president. It turned out to be Rodin’s signature. A Rodin, it might be added, worth between $4 million and $12 million. The foundation had no information on the bust’s provenance, so Mortillaro began to seek out details that would determine its authenticity. She contacted a variety of scholars but had little luck until she reached the Rodin Museum in Paris. Rodin expert Jérôme Le Blay wrote back to Mortillaro saying he would fly from Paris to see the piece, according to CNN. The art world, it turned out, had lost track of the Napoleon bust decades previously, Le Blay told the foundation. The discovery of the Rodin was made public only this month. The work was on display at the Madison town hall through Oct. 22, after which it was sent to the Philadelphia Museum of Art, where it will be on loan for the centenary of the artist’s death next month. Sunnyside is essentially Gothic Revival in style, featuring a gabled roof and dormers with scalloped bargeboard. However, there are Greek Revival elements, including the portico covering the front façade and the heavy proportions of the interior details. There are two compound interior chimneys located on each front gable end of the house and one large interior chimney located in the central rear section of the house. 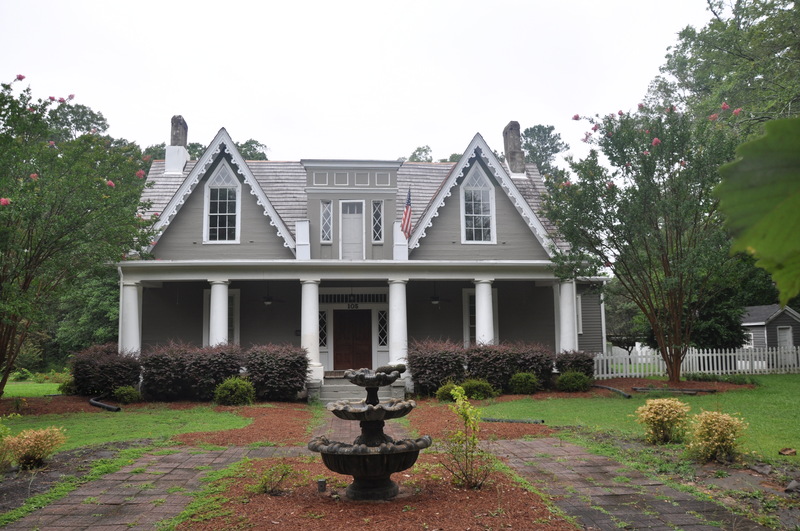 The house has been associated with several locally prominent individuals over the years. It was built by Robert Gillam, a prosperous farmer, roads commissioner and postmaster. Gillam lost the home during Reconstruction, but it was purchased by his son-in-law, Augustus Aiken. Aiken kept the home until his wife died in 1877. In 1906, Harry L. Watson, a newspaper editor and publisher in Greenwood, purchased Sunnyside. Watson also was chairman of Greenwood’s public school system, a trustee of Furman University, president of the South Carolina Press Association and the president of Greenwood’s National Loan and Exchange Bank. Watson, who was also a noted historian, compiling and publishing a significant amount of information about the South Carolina Piedmont region, served as the publisher of Greenwood’s daily paper, the Index-Journal, from 1919 until his death in 1956. Following Watson’s death, Sunnyside passed to his daughters Louise Montague Watson and Margaret Josephine Watson. Margaret Josephine Watson was a prominent journalist and historian in her right, having authored Greenwood County Sketches-Old Roads and Early Families. Although Margaret Watson would live until 1979 and Louise Watson until 1986, the Watson family sold the house in 1974. William James Dean and his wife, who purchased it from the Watsons, restored the structure. 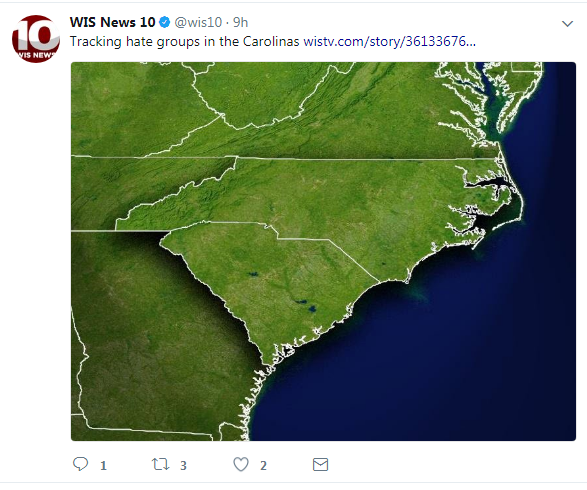 One gathers from the above Twitter graphic by a local South Carolina television station for a story titled “Tracking Hate Groups in the Carolinas” that we are now hate free. In fact, it would appear that the entire Southeast is devoid of hate groups. And civilization, for that matter. The image seems to represent the US in the middle of the, oh, Pleistocene Epoch. To be fair, hate groups were definitely in short supply back then, what with stone age cultures just coming into being and man too busy fending off predators to engage in serious hating. Neanderthals might disagree, however, if they were still around. In short, you can always count on local television to not only dramatize anything that might possibly frighten the elderly and youngsters, but to do so in an inept manner.